This article is about the bluegrass musician. For her band, see Union Station (band). For the Kent State student, see Allison Krause. Alison Maria Krauss (born July 23, 1971) is an American bluegrass-country singer and musician. She entered the music industry at an early age, winning local contests by the age of 10 and recording for the first time at 14. She signed with Rounder Records in 1985 and released her first solo album in 1987. She was invited to join the band with which she still performs, Alison Krauss and Union Station, and later released her first album with them as a group in 1989. As of 2018, she has won 27 Grammy Awards from 42 nominations, ranking her third behind Quincy Jones and classical conductor Georg Solti for most Grammy Award wins. She is the most awarded singer and the most awarded female artist in Grammy history. Alison Maria Krauss was born in Decatur, Illinois, to Fred and Louise Krauss. Her father was a German immigrant who came to the United States in 1952 and taught his native language. Her mother, of German and Italian descent, is the daughter of artists. Her older brother, Viktor, is also a musician. Krauss grew up in the college town of Champaign, home to the University of Illinois at Urbana–Champaign where she lived from 1971 to around 1990. She began studying classical violin at age 5 but soon switched to bluegrass. Krauss said she first became involved with music because "[my] mother tried to find interesting things for me to do" and "wanted to get me involved in music, in addition to art and sports". At the age of 8 she started entering local talent contests, and at 10 had her own band. At 13, she won the Walnut Valley Festival Fiddle Championship, and the Society for the Preservation of Bluegrass in America named her the "Most Promising Fiddler in the Midwest". She was also called "Virtuoso" by Vanity Fair Magazine. Krauss first met Dan Tyminski around 1984 at a festival held by the Society. Every current member of her band, Union Station, first met her at these festivals. Krauss made her recording debut in 1985 on the independent album, Different Strokes, featuring her brother Viktor Krauss, Swamp Weiss and Jim Hoiles. From the age of 12 she performed with bassist and songwriter John Pennell in a band called "Silver Rail", replacing their previous fiddler Andrea Zonn. Pennell later changed the band's name to Union Station after another band was discovered with the name Silver Rail. Pennell remains one of her favorite songwriters and wrote some of her early work including the popular "Every Time You Say Goodbye". Later that year, she signed to Rounder Records, and in 1987, at 16, she released her debut album Too Late to Cry with Union Station as her backup band. Krauss' debut solo album was quickly followed by her first group album with Union Station in 1989, Two Highways. The album includes the traditional tunes "Wild Bill Jones" and "Beaumont Rag", along with a bluegrass interpretation of The Allman Brothers' "Midnight Rider". Krauss' contract with Rounder required her to alternate between releasing a solo album and an album with Union Station, and she released the solo album I've Got That Old Feeling in 1990. It was her first album to rise onto the Billboard charts, peaking in the top seventy-five on the country chart. The album also was a notable point in her career as she earned her first Grammy Award, the single "Steel Rails" was her first single tracked by Billboard, and the title single "I've Got That Old Feeling" was the first song for which she recorded a music video. Krauss' second Union Station album Every Time You Say Goodbye was released in 1992, and she went on to win her second Grammy Award for Best Bluegrass Album of the year. She then joined the Grand Ole Opry in 1993 at the age of 21. She was the youngest cast member at the time, and the first bluegrass artist to join the Opry in twenty-nine years. She also collaborated on a project with the Cox Family in 1994, a bluegrass album called I Know Who Holds Tomorrow. Mandolin and guitar player Dan Tyminski replaced Tim Stafford in Union Station in 1994. Late in the year, Krauss recorded with the band Shenandoah on its single "Somewhere in the Vicinity of the Heart", which brought her to the country music Top Ten for the first time and it won the Grammy Award for Best Country Collaboration with Vocals. Also in 1994, Krauss collaborated with Suzy Bogguss, Kathy Mattea, and Crosby, Stills, and Nash to contribute "Teach Your Children" to the AIDS benefit album Red Hot + Country produced by the Red Hot Organization. In 1997, she recorded vocals and violin for "Half a Mind", on Tommy Shaw's 7 Deadly Zens album. Now That I've Found You: A Collection, a compilation of older releases and some covers of her favorite works by other artists, was released in 1995. Some of these covers include Bad Company's "Oh Atlanta", The Foundations' & Dan Schafer's "Baby, Now That I've Found You", which was used in the Australian hit comedy movie The Castle, and The Beatles' "I Will". A cover of Keith Whitley's "When You Say Nothing at All" reached number three on the Billboard country chart; the album peaked in the top fifteen on the all-genre Billboard 200 chart, and sold two million copies to become Krauss' first double-platinum album. Krauss also was nominated for four Country Music Association Awards and won all of them. So Long So Wrong, another Union Station album, was released in 1997 and won the Grammy Award for Best Bluegrass Album. One critic said its sound was "rather untraditional" and "likely [to] change quite a few ... minds about bluegrass." Included on the album is the track "It Doesn't Matter", which was featured in the second-season premiere episode of Buffy the Vampire Slayer and was included on the Buffy soundtrack in 1999. Her next solo release in 1999, Forget About It, included one of her two tracks to appear on the Billboard adult contemporary chart, "Stay". The album was certified gold and charted within the top seventy-five of the Billboard 200 and in the top five of the country chart. In addition, the track "That Kind of Love" was included in another episode of Buffy the Vampire Slayer. Adam Steffey left Union Station in 1998, and was replaced with renowned Dobro player Jerry Douglas. Douglas had provided studio back-up to Krauss' records since 1987's Too Late to Cry. Their next album, New Favorite, was released on August 14, 2001. The album went on to win the Grammy for Best Bluegrass Album, with the single "The Lucky One" winning a Grammy as well. New Favorite was followed up by the double platinum double album Live in 2002 and a release of a DVD of the same live performance in 2003. Both the album and the DVD were recorded during a performance at The Louisville Palace and both the album and DVD have been certified double Platinum. Also in 2002 she played a singing voice for one of the characters in Eight Crazy Nights. Lonely Runs Both Ways was released in 2004, and eventually became another Alison Krauss & Union Station gold certified album. Ron Block described Lonely Runs Both Ways as "pretty much... what we've always done" in terms of song selection and the style, in which those songs were recorded. Krauss believes the group "was probably the most unprepared we've ever been" for the album and that songs were chosen as needed rather than planned beforehand. She also performed a duet with Brad Paisley on his album Mud on the Tires in the single "Whiskey Lullaby". The single was quickly ranked in the top fifty of the Billboard Hot 100 and the top five of the Hot Country Songs, and won the Country Music Association Awards for "Best Musical Event" and "Best Music Video" of the year. In 2007, Krauss and Robert Plant released the collaborative album entitled Raising Sand. RIAA-certified platinum, the album was nominated for and won 5 Grammy Awards at the 51st Annual Grammy Awards, including Album of the Year, Best Contemporary Folk/Americana Album, and Record of the Year ("Please Read the Letter"). Krauss and Plant recorded a Crossroads special in October 2007 for the Country Music Television network, which first aired on February 12, 2008. Returning with Union Station, Krauss released a new album called Paper Airplane on April 12, 2011, the follow-up album to Lonely Runs Both Ways (2004). Mike Shipley, the recording and mixing engineer for the album, said that it took a lot of time to do the album because of Krauss' non-stop migraines. In 2014, she and her band Union Station toured with Willie Nelson and Family, with special guests Kacey Musgraves, and The Devil Makes Three. Capitol Records released Windy City, an album of country and bluegrass classics, produced by Buddy Cannon and her first solo release in 17 years, on February 17, 2017. Krauss received two nominations at the 60th Annual Grammy Awards for Best Country Solo Performance and Best American Roots Performance. Krauss has made guest appearances on other records on lead vocals, harmony vocals, and fiddle. In 1987, at the age of 15, she played fiddle on the album The Western Illinois Rag by Americana musician Chris Vallillo. In 1993 she recorded vocals for the Phish song "If I Could" in Los Angeles. In 1997 she sang harmony vocals in both English and Irish on the album Runaway Sunday by Irish traditional band Altan. Krauss had her only number one hit in 2000, receiving vocal credit for "Buy Me a Rose." She has contributed to numerous motion picture soundtracks, most notably O Brother, Where Art Thou? (2000). She and Dan Tyminski contributed multiple tracks, including "I'll Fly Away" (with Gillian Welch), "Down to the River to Pray", and "I Am a Man of Constant Sorrow". In the film, Tyminski's vocals on "I Am a Man of Constant Sorrow" were used for George Clooney's character. The soundtrack sold over seven million copies and won the Grammy for Album of the Year in 2002. Both Krauss and the surprisingly popular album were credited with reviving interest in bluegrass. She has said, however, that she believes Americans already liked bluegrass and other less-heard musical genres, and that the film merely provided easy exposure to the music. She did not appear in the movie, at her own request, because she was pregnant during its filming. In 2007, Krauss released A Hundred Miles or More: A Collection, an album of new songs, soundtrack tunes, and duets with artists such as John Waite, James Taylor, Brad Paisley, and Natalie MacMaster. The album was successful commercially but given a lukewarm reception by critics. One of the tracks, "Missing You", a duet with Waite (and a cover of his hit single from 1984), was similarly received as a single. On August 11, television network Great American Country aired a one-hour special, "Alison Krauss: A Hundred Miles or More," based on the album. Krauss appeared on Heart's March 2010 concert DVD Night at Sky Church, providing the lead vocals for the song "These Dreams". Other soundtracks for which Krauss has performed include Twister, The Prince of Egypt, Eight Crazy Nights, Mona Lisa Smile, Divine Secrets of the Ya-Ya Sisterhood, Alias, Bambi II and Cold Mountain. She contributed "Jubilee" to the 2004 documentary Paper Clips. The Cold Mountain songs she sang, "The Scarlet Tide" with T Bone Burnett and Elvis Costello, and "You Will Be My Ain True Love" with Sting, were each nominated for an Academy Award. She performed both songs at the 76th Academy Awards, the first with Costello and Burnett, and the other with Sting. She produced Nickel Creek's debut album (2000) and the follow-up This Side (2002), which won Krauss her first Grammy award as a producer. Krauss performed on Moody Bluegrass: A Nashville Tribute to The Moody Blues. She participated in Billy Childs' 2014 tribute album to Laura Nyro, Map to the Treasure: Reimagining Laura Nyro, performing on the track "And When I Die". Krauss' earliest musical experience was as an instrumentalist, though her style has grown to focus more on her vocals with a band providing most of the instrumentation. Musicians she enjoys include vocalists Lou Gramm of Foreigner and Paul Rodgers of Bad Company. Krauss' family listened to "folk records" while she was growing up, but she had friends who exposed her to groups such as AC/DC, Carly Simon, The Rolling Stones, Lynyrd Skynyrd, and ELO. She cites Dolly Parton, with whom she has since collaborated a number of times, as a major influence. Some credit Krauss and Union Station, at least partially, with a recent revival of interest in bluegrass music in the United States. Despite being together for nearly two decades and winning numerous awards, she said the group was "just beginning right now" (in 2002) because "in spite of all the great things that have happened for the band, [she] feel[s] musically it's just really beginning". Although she alternates between solo releases and works with the band, she has said there is no difference in her involvement between the two. As a group, AKUS have been called "American favourites", "world-beaters", and "the tightest band around". While they have been successful as a group, many reviews note Krauss still "remains the undisputed star and rock-solid foundation" and have described her as the "band's focus" with an "angelic" voice that "flows like honey". Her work has been compared to that of The Cox Family, Bill Monroe, and Del McCoury, and has in turn been credited with influencing various "Newgrass" artists including Nickel Creek, for which she acted as record producer on two of their albums. In addition to her work with Nickel Creek, she has acted as producer to the Cox Family, Reba McEntire and Alan Jackson. Adam Sweeting of The Guardian has said Krauss and Union Station are "superb, when they stick to hoedowns and hillbilly music, but much less convincing, when they lurch towards the middle of the road". and Blender magazine has said the "flavorless repertoire [Krauss] sings... steers her toward Lite FM". In addition, Q magazine and The Onion AV Club have said their newer releases are "pretty much the usual", and that although Krauss is generally "adventurous", these recent releases contain nothing to "alienate the masses". Krauss possesses a soprano voice, which has been described as "angelic". She has said her musical influences include J. D. Crowe, Ricky Skaggs, and Tony Rice. Many of her songs are described as sad, and are often about love, especially lost love. Though Krauss has a close involvement with her group and a long career in music, she rarely performs music she has written herself. She has also described her general approach to constructing an album as starting with a single song and selecting other tracks based on the first, to give the final album a somewhat consistent theme and mood. She most commonly performs in the bluegrass and country genres, though she has had two songs on the adult contemporary charts, has worked with rock artists such as Phish and Sting, and is sometimes said to stray into pop music. Krauss did not think she would make music videos at the beginning of her career. After recording her first she was convinced it was so bad that she would never do another. Nonetheless, she has continued to make further videos. Many of the first videos she saw were by bluegrass artists. Dan Tyminski has noted that the video for Thriller was very popular at the time she was first exposed to music videos. She has made suggestions on the style or theme to some videos, though she tends to leave such decisions to the director of the particular video. The group chooses directors by seeking out people who have previously directed videos that band members have enjoyed. The director for a video to "If I Didn't Know Any Better" from Lonely Runs Both Ways, for example, was selected because Krauss enjoyed work he had done with Def Leppard and, she wondered, what he could do with their music. While style decisions are generally left to the various directors of the videos, many – including for "The Lucky One", "Restless", "Goodbye is All We Have", "New Favorite", and "If I Didn't Know Any Better" – follow a pattern. In all of these videos Krauss walks, sometimes interacting with other people, while the rest of the band follows her. Krauss has said she used to dislike working in the studio, where she had to perform the same song repeatedly, but has come to like studio work roughly the same as live stage performances. Her own favorite concert experiences include watching three Foreigner concerts during a single tour, a Dolly Parton concert, and a Larry Sparks concert. She appeared on Austin City Limits in 1992 and opened the show in 1995 with Union Station. The New Favorite tour, after AKUS' album of the same name, was planned to start September 12, 2001 in Cincinnati, Ohio, but was delayed until September 28 in Savannah, Georgia following the September 11 terrorist attacks. Krauss took part in the Down from the Mountain tour in 2002, which featured many artists from the O Brother, Where Art Thou soundtrack. Down from the Mountain was followed by the Great High Mountain Tour, which was composed of musicians from both O Brother and Cold Mountain, including Krauss. She has also given several notable smaller performances including at Carnegie Hall (with the Grand Ole Opry), on Lifetime Television in a concert of female performers, on the radio show A Prairie Home Companion, where she sang two songs not previously recorded on any of her albums, and a performance at the White House attended by then-President Bill Clinton and then-Vice President Al Gore. She has also been in the White House again, performing the song "When You Say Nothing at All" at country music performances. She also performed a tribute to The Everly Brothers at which she sang "All I Have to Do is Dream" with Emmylou Harris and "When Will I Be Loved" with Vince Gill. She was also invited by Taylor Swift to perform with her at the 2013 CMA's and by Joshua Bell to perform with him on a Christmas album; Bell said that "she (Krauss) is someone I've adored for so many years now". She performed in Northwest, Washington, D.C. on January 10, 2015, as a part of "The Life and Songs of Emmylou Harris: An All Star Concert Celebration" which is a tribute to Emmylou Harris. Krauss has won a record twenty-seven Grammy Awards over the course of her career as a solo artist, as a group with Union Station, as a duet with Robert Plant, and as a record producer. She is currently tied with Quincy Jones as the winner of the second highest number of Grammy Awards. Only the late classical conductor Sir Georg Solti has more overall Grammys (31). She overtook Aretha Franklin for the most female wins at the 46th Grammy Awards, where Krauss won three, bringing her total at the time to seventeen (Franklin won her sixteenth that night). The Recording Academy (which presents the Grammy Awards) presented her with a special musical achievement honor in 2005. She has also won 14 International Bluegrass Music Association Awards, 9 Country Music Association Awards, 2 Gospel Music Association Awards, 2 CMT Music Awards, 2 Academy of Country Music Awards, and 1 Canadian Country Music Award. Country Music Television ranked Krauss 12th on their "40 Greatest Women of Country Music" list in 2002. At the 76th Academy Awards in February 2004, where she performed two nominated songs from the Cold Mountain soundtrack, Krauss was chosen by Hollywood shoe designer Stuart Weitzman to wear a pair of $2 million 'Cinderella' sandals with 4½ inch clear glass stiletto heels and two straps adorned with 565 Kwiat diamonds set in platinum. Feeling like a rather unglamorous choice, Krauss said, "When I first heard, I was like, 'What were they thinking?' I have the worst feet of anybody, who will be there that night!" In addition to the fairy-tale-inspired shoes, Weitzman outfitted Krauss with a Palm Trēo 600 smartphone, bejeweled with 3,000 clear-and-topaz-colored Swarovski crystals. The shoes were returned, but Krauss kept the crystal-covered phone. Weitzman chose Krauss to show off his fashions at the urging of his daughters, who are fans of Krauss' music. 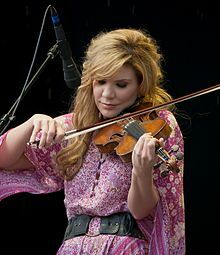 In May 2012, Alison Krauss was awarded an Honorary Doctorate of Music from Berklee College of Music. 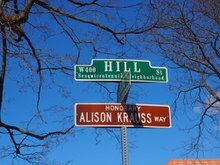 In March 2015, her hometown of Champaign, Illinois designated the 400 block of West Hill Street as "Honorary Alison Krauss Way". Krauss was married to musician Pat Bergeson from 1997 to 2001. Their son, Sam, was born in July 1999. 1991 Hee Haw Herself Episode: "No. 22.21"
2005 Sesame Street Herself Episode: "American Fruit Stand"
^ a b "Alison Krauss Biography". Angelfire.com. Retrieved 2015-05-19. ^ Martin Chilton (February 13, 2012). "Alison Krauss makes Grammy history". The Daily Telegraph. ^ Leopold, Ted (February 9, 2009). "Plant, Krauss rise with 'Raising Sand' at Grammys". CNN. Retrieved 2009-07-27. ^ "Songwriter/Composer: Krauss, Alison Maria" Archived October 19, 2015, at the Wayback Machine. BMI Repertoire Search. ^ Macnie, Jim (2004). Thomas Goldsmith, ed. The Bluegrass Reader. University of Illinois Press. p. 277. ISBN 978-0-252-02914-1. ^ "Alison Krauss + Union Station Flight Plan: Paper Airplane Lands AKUS Back On The Bus « Bluegrass Unlimited Bluegrass Unlimited". Bluegrassmusic.com. October 2, 2011. Retrieved 2013-07-01. ^ a b Pressey, Debra (March 7, 2015). "Krauss might get her way". The News-Gazette. Champaign, IL. Retrieved March 16, 2019. ^ a b "Alison Krauss Keeps Her Pace After Quick Start" by Ronna Rubin for GAC Music Beat, Great American Country, June 19, 2006. Retrieved 2006-06-28. ^ "1984 Walnut Valley Championship Archives – All Winners". Walnut Valley Festival official website. Archived from the original on November 10, 2006. Retrieved February 7, 2007. ^ "Alison Krauss interview". TV Guide. Retrieved July 2, 2012. ^ "Vanity Fair names Alison 'Virtuoso' | AKUS". Newfavorite.proboards.com. Retrieved 2015-05-19. ^ a b "Interview with Alison Krauss and Dan Tyminski" for The Collection on Great American Country, originally broadcast June 28, 2006; retrieved June 28, 2006. ^ a b MUSIC; "Country, With Twang and Pop" by Robbie Wolvier for The New York Times. Retrieved 2006-07-08. ^ "Alison Krauss + Union Station Flight Plan: Paper Airplane Lands AKUS Back On The Bus" by Larry Nager for Bluegrass Unlimited. Retrieved October 2, 2011. ^ "New Favorite" Archived July 27, 2011, at the Wayback Machine by Kerry Dexter for Dirty Linen No. 102 October/November 2002. Retrieved 2006-06-07. ^ "Alison Krauss – Full Biography" by Stephen Thomas Erlwine for Allmusic, hosted by MTV.com. Retrieved 2006-06-25. ^ a b c d "Alison Krauss Biography". CMT.com. Retrieved 2006-06-06. ^ "ALISON KRAUSS | Grand Ole Opry". Opry.com. 1993-07-03. Retrieved 2015-05-19. ^ "Alison Krauss". Grand Ole Opry. Retrieved July 2, 2012. ^ "Now That I've Found You" by Sidney Cox for Rounder Records. Retrieved 2006-06-12. ^ "BillBoard Country Charts". BillBoard. June 10, 1995. Retrieved July 2, 2012. ^ "BillBoard Chart History". BillBoard. June 10, 1995. Retrieved July 2, 2012. ^ "29th Annual CMA Awards". CMT. Retrieved 3 October 2017. ^ So Long, So Wrong review by George Graham. "The Graham Weekly Album Review No. 1065" as broadcast on WVIA-FM April 16, 1997. Retrieved 2006-06-12. ^ "When She Was Bad", originally released September 15, 1997. Twentieth Century Fox and Joss Whedon. ^ "Entropy", originally released April 30, 2002. Twentieth Century Fox and Joss Whedon. ^ "September 2001: Review in "Your Gazette", Melbourne Australia by George Peden: 'These Ladies Are New Favourites.'" by Candace Asher on CandaceAsher.com, September 2001. Retrieved 2006-06-06. ^ "Krauss 'Runs Both Ways' On New Album". Billboard.com. Retrieved 2015-05-19. ^ mtv (2009-02-09). "Robert Plant And Alison Krauss Win Grammy Album Of The Year". MTV.com. Retrieved 2015-05-19. ^ "Alison Krauss And Robert Plant". GRAMMY.com. February 8, 2009. Archived from the original on May 21, 2015. Retrieved May 19, 2015. ^ Elena See (2011-04-03). "First Listen: Alison Krauss And Union Station, 'Paper Airplane'". Npr.org. Retrieved 2015-05-19. ^ "Alison Krauss: Queen of Bluegrass music | The National". Thenational.ae. 2011-11-23. Retrieved 2015-05-19. ^ Klinge, Steve (2011-07-22). "Beautiful music despite the headaches - philly-archives". Articles.philly.com. Retrieved 2015-05-19. ^ "Spring, summer dates team Nelson and Family with Krauss and Union Station". Usatoday.com. February 10, 2014. Retrieved 2014-06-29. ^ "Willie Nelson and Alison Krauss and Union Station Featuring Jerry Douglas". Schottensteincenter.com. May 14, 2014. Archived from the original on September 24, 2015. Retrieved May 19, 2015. ^ "Willie Nelson and Alison Krauss Embarking on Co-Headlining Tour". Tasteofcountry.com. Retrieved 2015-05-19. ^ Bernstein, Jonathan (2016-10-13). "Alison Krauss on Nostalgic New Solo Album 'Windy City'". Rolling Stone. Retrieved 2017-02-23. ^ "Phish – Band History" Archived November 23, 2009, at the Wayback Machine. Retrieved 2009-12-10. ^ "O Brother, Why Art Thou So Popular?". BBC News, February 28, 2002. Retrieved 2006-06-25. ^ Evan Cater (2000-12-05). "O Brother, Where Art Thou? - Original Soundtrack | Songs, Reviews, Credits, Awards". AllMusic. Retrieved 2015-05-19. ^ a b "Interview on NPR Morning Edition". Bob Edwards, NPR, February 15, 2002. Retrieved 2006-07-10. ^ a b "Jerry Douglas and Ron Block of Union Station discuss their role in bluegrass music", PBS.org, May 3, 2002, via the Wayback Machine. Retrieved 2009-07-28. ^ a b c "Country: O Sister! Bluegrass Star Alison Krauss's New Favorite: Hers and Ours". barnesandnoble.com. August 14, 2001. Archived from the original on February 14, 2012. ^ "Alison Krauss - A Hundred Miles Or More: A Collection". Countrymusic.about.com. 2012-07-21. Retrieved 2015-05-19. ^ James Christopher Monger (2007-04-03). "A Hundred Miles or More: A Collection - Alison Krauss | Songs, Reviews, Credits, Awards". AllMusic. Retrieved 2015-05-19. ^ "On TV : Special : Alison Krauss: A Hundred Miles or More : Great American Country". Gactv.com. April 15, 2015. Archived from the original on August 24, 2014. Retrieved May 19, 2015. ^ "Music Review – Night At Sky Church". Jack Goodstein, April 26, 2011, SeattlePI.com. ^ a b "Sting, Alison Krauss, Elvis Costello and T Bone Burnett to Perform at The 76th Academy Awards". Press release by Toni Thompson for the Academy of Motion Picture Arts and Sciences via the Wayback Machine on February 14, 2004. Retrieved 2009-07-28. ^ "Moody Bluegrass: Rocking Through the Hills". NPR.org. 2004-12-30. Retrieved 2015-08-25. ^ "Alison Krauss Joins Billy Childs on Laura Nyro's 'And When I Die' (Exclusive) - Speakeasy - WSJ". Blogs.wsj.com. 2014-07-15. Retrieved 2015-05-19. ^ Simon, Scott (2014-09-06). "Stars Line Up To Reimagine Laura Nyro". NPR.org. Retrieved 2015-09-05. ^ Krauss cultivates bluegrass into crossover success Archived August 27, 2006, at the Wayback Machine by Neil Curry for CNN on November 16, 1999. Retrieved 2006-06-29. ^ "Alison Krauss 'comes out' on heavy metal" for JAM! Music by Jane Stevenson. Retrieved 2006-06-27. ^ "Krauss still hanging on to eclectic style" for the Los Angeles Times/The Washington Post on October 13, 1997. Retrieved 2006-06-29. ^ Sexton, Paul (July 22, 2009). "Alison Krauss interview for the release of Essential Alison Krauss". Telegraph. London. Retrieved 2009-07-29. ^ "Alison Krauss & Union Station Live Review" by Chris Jones for BBC. Retrieved 2006-06-15. ^ a b c "Alison Krauss & Union Station Lonely Runs Both Ways Review" by Sue Keogh for BBC. Retrieved 2006-06-15. ^ a b "Alison Krauss & Union Station – Lonely Runs Both Ways (CD, 2004)" Archived October 5, 2006, at the Wayback Machine by Ben Fitzgerald, Bluegrass Works, December 13, 2006. Retrieved 2006-06-15. 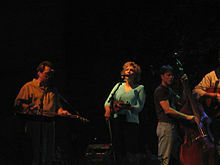 ^ "Alison Krauss and Union Station" Archived June 15, 2006, at the Wayback Machine by Kim Ruehl on FolkMusic.About.com. Retrieved 2006-06-24. ^ "Alison Krauss Produces Alan Jackson" from Great American Country on May 10, 2006 citing The Tennessean. Retrieved 2006-06-26. ^ "Alison Krauss and Union Station, Lonely Runs Both Ways (Rounder Records)" by Adam Sweeting for The Guardian (UK). November 19, 2004. Retrieved 2006-06-15. ^ "Lonely Runs Both Ways" on Metacritic originally from Blender magazine Jan/Feb 2005. Retrieved 2006-06-15. ^ "New Favorite" on Metacritic, originally from Q Magazine September 2001 and The Onion AV Club. Retrieved 2006-06-15. ^ Hermes, Will (April 11, 2011). "Alison Krauss and Union Station – Review". Rolling Stone. Retrieved January 20, 2012. ^ New Favorite Archived February 12, 2006, at the Wayback Machine by Kerry Dexter from Dirty Linen No. 102 Oct/Nov 2. Retrieved 2006-06-29. ^ "Sad songs, migraines don't get Alison Krauss down" by David Veitch for JAM! Music. Retrieved 2006-06-27. ^ Dickie, Mary (May 11, 2005). "Alison Krauss tends bluegrass revival". JAM! Music. Archived from the original on January 15, 2013. Retrieved June 27, 2006. ^ "Alison Krauss & Union Station: New Favorite" by George Graham, The Graham Weekly Album Review No. 1250 broadcast on WVIA-FM August 18, 2001. Retrieved 2006-07-08. ^ a b Interview with Alison Krauss and Dan Tyminski on GAC Nights[permanent dead link]. Great American Country originally broadcast June 27, 2006; retrieved June 28, 2006. ^ Interview with Krauss from the Alison Krauss + Union Station: Live DVD by Rounder Records released in 2003. ^ "Alison Krauss on Austin City Limits" from PBS from 1996 via the Wayback Machine; retrieved July 28, 2009. ^ COUNTRY BEAT: Alison Krauss, Wynonna Judd, Dolly Parton ... for MTV.com on September 17, 2001; retrieved June 25, 2006. ^ "Krauss, Loveless Among Down From The Mountain Headliners" for MTV.com on October 17, 2001; retrieved June 25, 2006. ^ "Down from the Mountain tour" by Jim Durden for Tomlin Communications on July 20, 2002; retrieved June 25, 2006. ^ "Carnegie Hall performance" at Great American Country March 1, 2006; retrieved June 26, 2006. ^ "Program details" from Prairie Home Companion on May 1, 2006; retrieved 2006-06-26. ^ "Alison Krauss at the White House" Archived May 14, 2007, at the Wayback Machine by Marian Leighton Levy at Rounder Records May 18, 1995; retrieved June 29, 2006. ^ "Alison Krauss performs "When You Say Nothing at All" at Country Music: In Performance at the White House | The White House". Whitehouse.gov. November 21, 2011. Archived from the original on October 19, 2014. Retrieved May 19, 2015. ^ "Vince Gill, Alison Krauss Pay Tribute to the Everly Brothers". Theboot.com. Retrieved 2015-05-19. ^ "Vince Gill, Alison Krauss And Emmylou Harris Pay Tribute To Everly Brothers". Rttnews.com. 2014-10-27. Retrieved 2015-05-19. ^ "Musical Gifts From Joshua Bell & Friends Available Now for Pre-Order | The Official Joshua Bell Site". Joshuabell.com. Archived from the original on October 19, 2015. Retrieved May 19, 2015. ^ "Alison Krauss Joins Emmylou Harris Tribute Concert". Billboard.com. Retrieved 2015-05-19. ^ "Alison Krauss, Conor Oberst Added to Emmylou Harris Tribute Concert «". Radio.com. November 21, 2014. Archived from the original on December 7, 2014. Retrieved May 19, 2015. ^ List of awards and nominations received by Alison Krauss. List of Alison Krauss' awards. Retrieved 2012-02-13. ^ "Alison Krauss & Union Station Win Three Trophies at Grammy's" Archived May 16, 2007, at the Wayback Machine for Proper Music Distribution on February 20, 2006; retrieved June 5, 2006. ^ "Rounder recording artist becomes Grammy's most-honored female musician", Press release on Shorefire and the Los Angeles Times by Jen Chapin and Robert Hilburn on February 9, 2004 via the Wayback Machine. Last accessed 2009-07-28. ^ "Recording Academy Honors Krauss, Scruggs, McGraw and the Winans" by Edward Morris for CMT.com on November 8, 2005; retrieved June 7, 2006. ^ "Past International Bluegrass Music Association Awards Recipients" Archived February 23, 2009, at the Wayback Machine for IMBA.org. Retrieved 2009-07-28. ^ Alison Krauss's CMA Awards from CMAAwards.com. Retrieved 2009-07-28. ^ "Alison Krauss and Union Station's CMA Awards" from CMAAwards.com; retrieved July 28, 2009. ^ "2005 Awards archive" from CMT.com; retrieved July 28, 2009. ^ 2008 Awards archive from CMT.com; retrieved July 28, 2009. ^ 2009 Awards archive from CMT.com; retrieved July 28, 2009. ^ "Alison Krauss ACM wins and nominations" Archived June 10, 2011, at the Wayback Machine by acmcountry.com. Retrieved 2009-07-28. ^ "2000 CCMA Award winners" Archived June 12, 2010, at the Wayback Machine on CCMA.org. Retrieved 2009-07-28. ^ "CMT's 40 Greatest Women of Country Music" on CMT.com; retrieved July 27, 2009. ^ Lee, Lisa. "'Cinderella' Krauss Tries On Her Slippers". CMT.com., February 27, 2004; retrieved October 31, 2007. ^ "Grammy Award-winner Alison Krauss to carry Swarovski crystal-clad Treo 600 smartphone" by Geekzone.co.nz; retrieved November 1, 2007. ^ Betts, Stephen L. (April 3, 2012). "Alison Krauss, Eagles to Receive Berklee College of Music Honorary Degrees". Theboot.com. Retrieved February 23, 2017. ^ Crane, Tracy (March 26, 2017). "What's in a name?". The News-Gazette. Champaign, IL. Retrieved March 16, 2019. ^ Cramer, Alfred W. (2009). Musicians and Composers of the 20th Century. 3. Salem Press. p. 798. ISBN 1587655152. ^ Menaker, Daniel (January 24, 2002). "AT HOME WITH/Alison Krauss; O Superstar, Where Art Thou?". The New York Times. ^ Abbey, Cherie D.; Omnigraphics; Hillstrom, Kevin (2005). Biography Today: Profiles of People of Interest to Young Readers. Omnigraphics. p. 271. ISBN 0780806921. 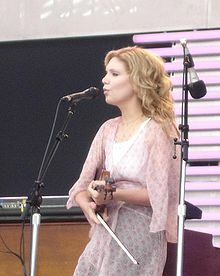 Wikimedia Commons has media related to Alison Krauss.